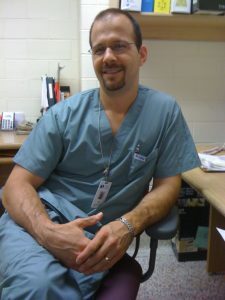 Mr. Tony Kajnar is a senior therapist at the Sault Area Hospital. His work experience extends from diagnostic testing to the anesthesia assistant (AA) role. Beyond his main responsibilities at work, he has assisted with the expansion of the AA role at his hospital, co-chairs the Canadian Pulmonary Function Testing Symposium, leads the Pulmonary Diagnostic Committee with Respiratory Therapy Society of Ontario (RTSO), and assists RTs and PFT labs with adhering to the latest and best guidelines. Tony and I crossed paths as we both actively look for clarity in the pulmonary diagnostic field. His extensive knowledge, drive to improve the filed, and willingness to help others has positioned him to be a mentor to many including RTs. He was kind enough to take time out of his busy schedule to answer my questions. To begin, let me ask two of my favourite questions to ask RTs: When did you first hear about the respiratory therapy field? What made you decide to become an RT? After my first years of college I realized I did not enjoy my choices and attempted to reevaluate my career options, I ultimately completed aptitude and interest testing to get career ideas. I took a Myers-Briggs test and completed a book entitled “What Color is your Parachute”, these lead to several healthcare career suggestions. At the top of the list was Respiratory Therapy, which I had never heard of. I came up with a list of questions and contacted my local hospital RT department who were kind enough to provide a tour and answered my questions. I was impressed with the freedom and variety that their daily role provided and then began working toward enrolment. Since graduating from the RT program you have had various roles, what are some of your memorable roles so far? Like so many, I began as a staff therapist in a hospital. The market was quite competitive so I worked part time for nine years. I had obtained my CPR, ACLS and PALS instructor’s certificates and enjoyed providing continuing education as my schedule allowed. During my instructor work I got involved with simulation education and simulation teaching, which I am pleased to see in concurrent education these days. The most challenging role to date was as an anesthesia assistant. What made you decide to study and pursue AA? Previous exposure to OR/anesthesia rotations in the RT program and our staff anesthesia department were quite positive for me. Our hospital was part of the MOHLTC pilot into anesthesia care teams, our site was designated for an intra-op RRT/AA component and a post-op pain management with an RNEC. This pilot was externally funded for two years but has since become part of our hospital program. How has your experience working as an AA been? What are some areas of satisfaction and challenges working as an AA? This role forever changed my perspective and bolstered my interest in health care. The role was a great opportunity with so many difficult challenges to navigate. A mantra from the Michener’s AA programs was “you don’t know what you don’t know” and that truly was reflected in the things that we were exposed to. The more you learn the greater the engagement. Our hospital did not have an RT role in the OR prior to the AA pilot, this created a very challenging environment in addition to the significant time investment in completing the basic and advanced AA programs. Travelling to the Michener for our practicums and the late hours completing weekly assignments were both difficult and awesome. Any comments or advice for RTs who may want to consider becoming an AA? This is an excellent opportunity for anyone truly interested in a role related to anesthesia. There is a lot of competition and the path is extremely challenging. Exposure to this role could help provide a better idea if the commitment is the right fit for you. The role will vary from site to site which may influence your decision, so it is best to learn what you can from those practicing in your area. How has the field changed over the years and has it been due to change in technology/equipment? Pharmacology? Protocols/practices? How do you see the role of an AA and the field of AA in the future? My AA involvement was during phase one of the MOHLTC’s anesthesia care team model. This initiative involved the CAS, their engagement and support is extremely important. An RRT background may provide an edge for the clinical components of the AA profession but my greatest learning challenges were with the pharmacology and physiology involved with the anesthesia role. Anesthesia offers a departure from the acute care RRT role. I was surprised to learn how the AA role was present for many years in Toronto, this was highlighted by the great faculty of the Michener Institute’s AA programs. Some of my classmates were Quebec-trained RRT’s and I was impressed to learn how much the Quebec RRT program’s entry to practice competencies focus on anesthesia, not acute care. The AA role is young and will no doubt change in ways that we cannot foresee. It is important that we continue to have RT involvement in this exciting role. How did you get involved with working and managing a PFT lab? Have always had exposure to the PFT lab through the different hospital postings I have held. It was a role I rotated through initially then had more permanent assignment in. This eventually led to my current senior role in our hospital based PFT lab. It is a great blend between technology, instrumentation and patient care for me. There are plenty of opportunities for direct patient feedback, which is a great source of satisfaction. Any comments or advice for those who may want to work in a PFT lab? Our entry to practice competencies provides an introduction to pulmonary diagnostics but there is a lot consider with providing a formal diagnosis of lung disease and how our findings support treatment. The ATS, ERS, CPSO and CTS practice and quality assurance guidelines are a good place to start in understanding the technical requirements related to this area of practice. Understand the contraindications to testing you are involved with and actively screen for them prior to testing. The quality based procedures and certified educator roles are also important to review and understand as they apply to the continuum of care. Knowledge and understanding of the published practice guidelines is also important. As standards change we need to be aware how this affects both diagnosis and treatment for lung disease. How can the field of PFT improve to better serve the population? There are many quality assurance standards to consider with lung function testing which are essential in categorization of lung disease and treatment. We can all appreciate that objective lung testing is required to establish lung disease but only 50% of asthmatics and even less COPD patients have had such testing. We must appreciate that there is a care gap; we need to support more accurate diagnosis and follow up to guide appropriate treatment in any lung condition. Many patients being treated for lung disease have not had appropriate lung function tests to confirm or rule out their diagnosis. For some RTs and HCPs working in the acute care settings, the only exposure they have to COPD and Asthma patients is during the exacerbations. As someone who helps COPD and asthma patients during all stages of their disorder or disease, what advice you have to share with RTs? We need to advocate for documenting accurate lung function, screening for post bronchodilator reversibility and ongoing follow-up testing in patients. Many patients with COPD and Asthma are not optimized and follow-up testing or assessments may not be considered after symptoms have been controlled. Testing can help support titration of their inhaled medications. Careful review of treatment, effectiveness of treatment and accurate categorization is also important in an effort to prevent future exacerbations. Many patients may not be aware of their diagnosis and some may not understand their treatment options and delivery devices. There are many opportunities to help patients gain better control. With a sudden burst of various puffers coming to the market over the last 3 years, what is important to keep in mind? How can RTs better assist their patients with their puffers? The new treatment options require us to continually review and update our knowledge in order to maintain consistency for the patient. The medications and their role in respiratory guidelines are part of our best practices. Being familiar with these medications, their delivery devices, mechanisms of action, interactions and precautions is all part of our professional responsibility. I am going to ask few questions about the leadership side of your career. In Sault Area Hospital you have been involved in many projects which not only improved the quality of patient care, but also expanded the role of RTs and AAs. How did you get involved with or initiate changes in your hospital? Some experiences were the result of job postings; other initiatives came from interest or certifications I worked towards. Policy and procedure updates have always been a challenge for me. Sometimes the need to change has been a result of ongoing best practice and clinical guideline updates. Other times it was from staffing or operational changes that brought new duties or refined them. Developing effective communication with administrators and clinical leaders to outline policy and training required to accomplish appropriate changes is an area where our profession could benefit from additional resources, groups and references. Any recommendations for those who want to initiate positive change in their work environment? Get involved in areas you are passionate about, this makes the work you put into the role much more enjoyable. There are many opportunities with your professional associations, get involved where you can as there is always need for our profession to support future growth with our ever-changing health care system. You have been active in improving the quality and standards of diagnostic testing including PFT. How did you get involved with the Canadian Pulmonary Function Symposium? What have been your goals? How could RTs benefit from this annual symposium? Several clinical practice issues lead to a search for clinical resources in order to address them. I attended the Medgraphics Cardiorespiratory Diagnostics Seminar in 2014 and was shocked to learn that it has been offered every year since 1994. I got involved with the Canadian Pulmonary Function Symposium after it ran in 2015. I attended and offered to get involved with my fellow co-chairs, Laura Seed and Murray Beaton. The Canadian PFT symposium is intended to be a resource for any clinician interested in pulmonary diagnostics. Speakers and topics reflect current topics in addition to reviewing best practices and quality assurance requirements for pulmonary diagnostics. This experience has provided opportunities to meet several individuals, researchers and manufacturers who have helped answer clinical questions and motivated my ongoing involvement in supporting pulmonary diagnostics advocacy. On a path to clarify and improve guidelines and protocols, you have been active in asking questions, surveying practices across the country, and vocalizing important concerns that need attention. In your opinion, what are some areas that need more attention? What are some of the obstacles? How can RTs get involved? I believe communication and knowledge transfer is an obstacle for our profession given our relative numbers to other professional groups. It is easy to get lost in our health care system. My hope is to have a supportive clinical practice network that includes respiratory therapists. There are many clinical practice areas that would benefit from formal study and publication involving the RRT role across all practice settings. Research is an area I hope to see more RRT’s getting involved in for benefit of patients, the profession and our health care system. Looking at the RT profession, what do you see as the next big growth area? Don’t think I can accurately predict the next area of growth but I certainly hope that we will see the development of an advanced practice respiratory practitioner, similar to the nurse practitioner role. Such a role could support patients with lung disease in ways that go beyond our current authorized acts. This role could also support our profession through advocacy and research as well as providing a goal for other colleagues to work toward. As we get close to the end of this interview, do you have any final words or comments for the readers? Certainly hope to see more RT’s get involved in promoting health care, advocating health care reform and research. Hope to see RT’s support others for the benefit of patient care and best practices. Thank you, Tony, for taking the time to answer my questions. Also, thank you for your ongoing contributions in the respiratory therapy field! If you would like more information about the upcoming PFT Symposium check out http://www.cacpt.ca/PFT-Symposium-2018-Details.pdf . This year’s event is taking place in Calgary, AB, from September 21st to 22nd (2018).